Matt, Louisa, Elsie! Do not tease your sister! Jeremy, you know better! There were so many different things for the kids to do. We went into the mini planetarium. 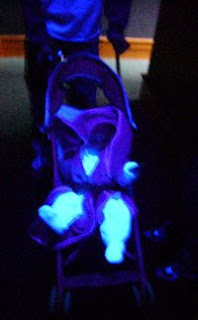 The ultra-violet light was exciting. The kids were more interested in Donna's glowing outfit than the stars on the roof. But finding out new and exciting things is what the museum is all about. Matthew immediately asked how much a UV light would cost and whether he could get one installed in his room. I'm not quite ready to have him tripping out to UV. 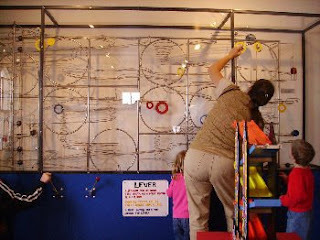 Mary got very involved in the Rube Goldberg device. She's been intrigued in these things since we first went to the Headwaters Science Center the first year we moved up here. Last year we went there also. There were displays on road construction, puppet theater, bee hives, and all sorts of fun. They didn't have any live animals. Only dead ones. That's something that sets Headwaters in Bemidji apart. Their kaleidescope display was excellent. Donna wasn't able to enjoy the displays. But she sure did enjoy watching her siblings be so happy! Joy is an infectious thing. It's very important to remember such a simple thing when dealing with grown ups. With babies it seems to come naturally. After all, they can only respond to your emotions. But adults seem still have this basic instinct. I think that is a good reason for Lutheran pastors to look at themselves and take a good evaluation of how their own affect effects their congregations. So many churches today are based on joy that has no real underpinning in the Resurrection of Christ. And too many Lutheran pastors tend to distance themselves from communicating Joy in the Work of Christ for us. Joy is not always happy and smiley. Sometimes true Joy will cause us to break down in tears. It's all wrapped up in the fact that we are both saints because of Christ's work for us and sinners because of our own inherited sinful natures. And a smiling, poopy, giggling baby can show us how simple true Joy really is. 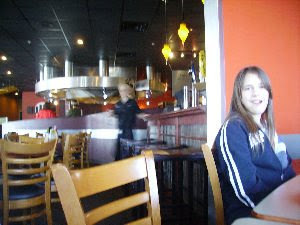 After the Science Museum we went to a Mongolian Grill for Lunch (noon meal to all you midwesterners). I don't remember the name of the restaurant. It's weird. This is the second Mongolian restaurant I've eaten at since I've developed symptoms for Celiac Disease. 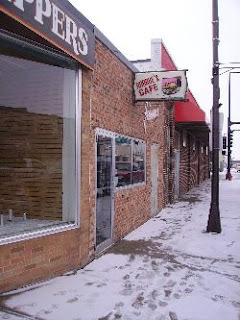 The first was Panda Restaurant in Grand Forks, ND. This was my second. It was Hu Hot. Celiacs should understand that the Mongolian grill is not cleaned really well between different dishes. What you do at a Mongolian grill is select your own ingredients for the grill and put your choice of sauces on the ingredients. Because the grill is not fully cleaned between each dish there could be some gluten contamination. Panda grill in GF throws the ingredients on the grill and walk around the grill full circle and then serve the cooked ingredients. The Hu Hot grill we were at in Fargo put each plate of ingredients in its own section of the grill. The grill was cleaned very regularly. But the cooks used the same tools for all the dishes they cooked. Among the ingredients were wheat based noodles and various sauces that had soy-sauce with wheat as part of their base. For whatever reason, I did not have a reaction to any gluten. Perhaps it was too minimal for me to have to run to the toilet. But I was simply glad that I could have such delicious food. Those who watch the map and list of readers will notice that we've had readers from several distant lands. If you are reading from the Continents of Asia, Africa, Europe, Australia, or South America, please drop me an email if it won't expose you to any kind of persecution. I would really like to hear your story, and I think that the other readers of this blog would like to hear your story as well. But like I said, if responding won't open you up to any persecution, then please send me an email. Otherwise, look out for yourself and your family. OK, I'm going to spend a disproportionate amount of space to just a few days of R&R. But I like these days. So, tough it out. I owe my rest to my beloved wife, Mary. Monday 3/24 we went to Fargo, ND for a vacation. I realize that this is not a common destination for Midwesterners. Mostly the tourists are Japanese college students who are trying to reenact scenes from the movie "Fargo". I can't help but think my life and family are much more satisfying than these deluded and rich college students. So we packed up and headed to Fargo. We stopped at the visitors center. Mary drove the van. I slept most of the time. We got to the visitor's center and the ladies there were very wonderful. They helped us find several restaurants that served gluten free food. So we went to Xtreme Pizza Kitchen for our supper. 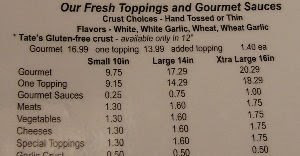 I had a 12 inch gluten-free pepperoni, sausage and mushroom pizza. And it was good. There were other customers when we arrived. And two old guys were there eating a gluten free pizza. The last slice of the pizza was almost the limit of my capacity. But it was great to get pizza at a restaurant that wouldn't make me have to dive to the bathroom a half-an-hour later. While we were at the Visitor's center for Fargo I shopped around for Sporting goods stores. I knew that Louisa would want to go to the big Mall in Fargo. No surprise there. But I kind of joked that for every hour at the mall we would spend 2 hours looking at sporting goods, especially handguns. 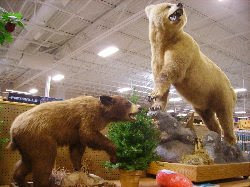 The main attraction for me, and with the taxidermied animals for the kids, was Sportsman's Warehouse. Here in this photo you can see just a small reason why I liked this stop so much. 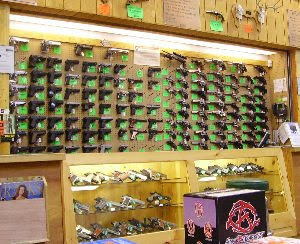 Each position on this display rack held two or three pistols of the same model. Mary and I could name whatever came to mind and hold the pistol, open it up, dry fire the pistol, etc.. And their prices were lower than any other place we have looked at. I have to say that I was smitten by the Sig-Sauer Mosquito, at .22 caliber Sig pistol. Those who have enjoyed the Jack Bauer character from the TV series "24" might know that Jack uses a Sig-Sauer 229. The Mosquito is the same pistol in .22LR caliber. It would be great for plinking and rodent control. I am so pathetic. I drool over something so unnecessary as a Sig Mosquito. After all, food on the table is much more important, don't you think? We holed up at the Motel 8 in Fargo. We got a suite with 2 bedrooms and a full size hide-a-bed for $65 a night. I was extremely happy with that rate. The kids were happy with the TV. Go figure! 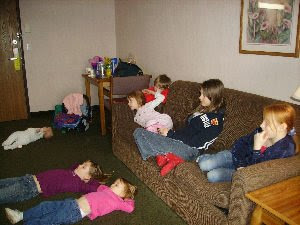 But we watched movies like "Over the Hedge" and such. I like the fact that William Shatner was able to make such a mockery of himself in that movie. Well, as you can see from the post title, this is just the first post on our mini-vacation. Too bad you have to suffer through more of it tomorrow. The Friday before Holy Week (3/14) was busy with sermon prep and a visit. The Saturday before Holy Week we celebrated as Palm Sunday at Mt. Olive. All the Saturday School kids (in the same family) were sick. So no Sat. School. I held a questioning of my student who has Autism with his brother and Grandmother. Nitro (his name) did exceptionally well. Some day I think I should write about the various considerations that go into Catechizing a student with Autism. But with so many irons in the fire now, that will probably be a ways off. Palm Sunday (3/16) I held worship at St. Petri, Oak Park, and Nazareth. And then we dive into Holy Week. Kyle N. and his brothers finished the wall in our basement. We have a new bedroom now for a couple of our kids. We've begun painting and re-arranging. Louisa, our oldest daughter, is not satisfied because the bedroom is not hers. But those are the breaks in a large family. Monday and Tuesday were filled with several Pastoral jobs and calls, not the least of which was finalizing 4 sermons for Wed. School, Maundy Thursday, Good Friday, and Easter. 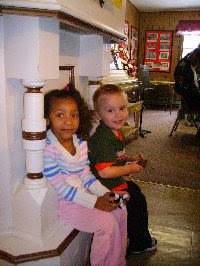 Wed. School went well (3/19). 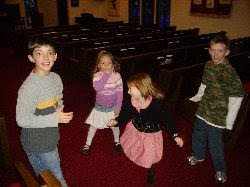 I put the confirmands through a review of their questioning and taught them the distinctions between a Moral, Moral Law, Natural Law (Biblical, and Secular), Moraizing, Pietism, and all other such nonsense of bending someone's will to a law that is not predicated upon the Moral Law of God. Thursday (3/20) we had worship at Mt. Olive and Oak Park with Questioning of Confirmands at Oak Park. Matt, Louisa, and Jake did very well. Friday we had Tenebrae service at St. Petri with Questioning of Confirmands. Briley, Shane, and Whitney did very well. 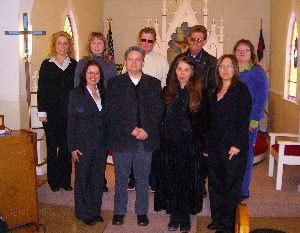 And we had Tenebrae service at Nazareth. Some time I'll post my Tenebrae service. The service itself has the congregations reading the prophecies in the Old Testament about each part of the Passion of Jesus Christ; the Pastor reads the Gospel lesson fulfillment of the Prophecies up to the burial of Jesus. Special attention is given to Psalms 16 and 22, and Isaiah 52-53. Saturday (3/22) we enjoyed the festivities of Christ's resurrection on Holy Saturday at Mt. Olive. The Saturday School children sang for the congregation and did an excellent job. Katie and Chantelle are 7 years old, Anna is 6 years old. And it is my privilege to teach them. My parents and my son, Jeremy, came to visit us on Saturday to stay through Monday; celebrating the resurrection of Jesus Christ with us. Sunday I held Easter worship at St. Petri, Oak Park, and Nazareth. After a long day of worship and preaching, Mary had a wonderful meal for our family waiting. A short time after our meal we had an Easter Egg hunt. Each of the kids was given a particular color of egg to find. I got to hide them. I know that there might be some readers who are baffled by an Easter Egg hunt. I don't know if the readers from Kazakhstan know what this is. And I realize that there might be some readers around the world that wonder what in the world those Americans have in their heads. But realize that the popular mythology of Easter being derived from some kind of Anglo-goddess Oestra is a total fiction. There never was such a mythology in history. This false-goddess is a fiction of moderns from the late 1960s and on. In truth, Easter Eggs were used by the Eastern Church as a symbol of the resurrection of Jesus Christ. 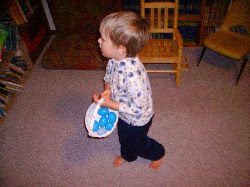 Easter egg hunts and all the hullabaloo around finding them can be a very useful and fun way of teaching children about the resurrection. That's how we use Easter egg hunts. 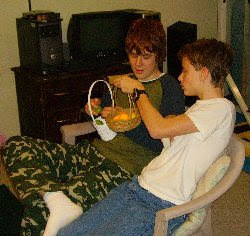 What I find entertaining about the whole thing is that my oldest two children; Jeremy and Matthew; were so involved in their search for the eggs that they didn't care about the fact that even the littlest kids were engaged in the same game. Since I hid the eggs, I made sure that the older kids had a more difficult time finding them. I can be so devious when I want to be. And then there is the enjoyment of the candy and eggs themselves. I am so glad that my Parents and my oldest son could be here with us to celebrate the Resurrection of our Lord. We know, yes, very personally, that death is the ultimate consequence of sin. My younger brother died young, over 4 years ago. We've had too many family and congregational funerals to think about. But Christ died and Raised Himself from the Dead to show us that we have eternal life through Him. Because of Christ's resurrection we have the certainty that those who have died in faith before us are not lost. We do not grieve them as those who have no hope. We will be reunited with them in Christ at the Last Day. God bless you this Easer! A truly sad time, but also a truly wonderful time. I'll try to get Bert's obituary posted in the side menu soon. Bert's family was great to work with for the congregational funeral. It was hard to preach. At Yvonne's funeral I was able to get the family together with their mom and dad for a family photo. They wanted to do this again today. Bert had 12 children. Yvonne passed away last Dec. 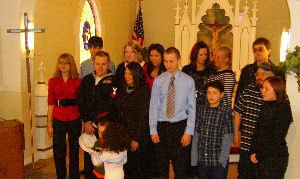 There were nine that were able to be here with their children and grand-children. Bert's son-in-law, Steve C., wrote a very nice hymn for the occasion and sang it with Kevin W. as the family entered. Because of the time of year preaching on the purpose of Christ's death and especially his cry of "My God, My God, Why have you forsaken me?" was directly fitting. After all, so many of us, as sinners, feel abandoned by God when we grieve. But we are not. The only one who was truly abandoned by our Heavenly Father was Jesus Christ himself on the Cross. And that abandonment was for our sakes, so we would never have to be abandoned by God. True comfort comes in knowing that this life is not the end for those who have faith in Christ. True comfort comes in dwelling in His Word and Sacraments, knowing that He is securing us not for some kind of social prosperity in this world, but for a true, real, and bodily resurrection at the last day. Because Christ was abandoned, we will never need to face any abandonment by God. Bert is home with Christ. We will see him again, whole, restored--along with Willie and the rest of those who have gone before in the faith. What we hope for now is that his children, grand-children, and great-grand-children will remain in this faith nourished by the same Word and Sacraments of Christ that brought Bert safely to our Savior's throne. Please keep their family in your prayers. The week before Palm Sunday and Holy week was event filled as ever. I left off on Friday 3/7 with news about Bert G. I'll fill that in soon. Sat. 3/8 we had worship at Mt. Olive and Sat. School. I held private Confirmation class with my student who is autistic. I believe he is ready to be confirmed. We have examinations on Maundy Thursday and Good Friday for the Confirmands. Nitro's autism makes this kind of public examination more difficult, so I'll work out something different for him. The fog in the morning made the drive to church beautiful. I got home and my kids were eating breakfast. Sophie decided she didn't see any advantage to using a spoon. 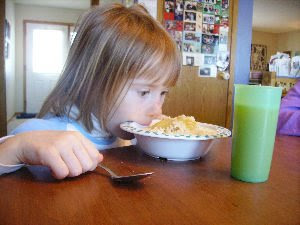 Suction was her first choice for inhaling her cereal. I perplex my wife so much. 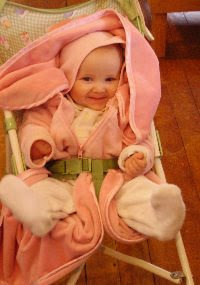 She's been trying to work out a nice post-Lent/Easter getaway for our family. Her main concern is that it be relaxing for me. Of course, there are probably some reasons for self-preservation that she harbors. If I'm worn out, I can't help her with the kids, and she gets more worn out. What was it Bertrand Russel called it? A "Vicious Circle?" The perplexity comes in when she asks me what I would like. "I dunno?" "Would this idea work?" "I dunno. I just gotta get my sermon done." "Well, let me know if this would help." "OK." Poor Mary. She is so good to me. We are very much like the Daoist's description of the Yin-Yang in our lives. No, I do not ascribe to Daoism as a religious faith. 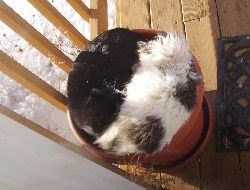 I just had this photo of our cats in a flower pot as if they were the Yin-Yang. And Mary is my Yin, I am her Yang. Yeah, that sounds funny. I think it's better to describe her as "an help meet for" me. We was made for eachother. And I'm glad God brought us together. Sunday 3/9 Worship, Worship, Worship, Hospital call. At the second worship service we had the call that Bert G. died. Monday, 3/10, Visits and Funeral planning. Bert's family has been hit hard this year. Bert's brother Willy died a year ago in December. Bert's daughter, Yvonne passed away this past December. Bert's sister, Ella, passed away a week before Bert. So the week looks like this: Tues 3/11 Worship and Bible Study at Mt. Olive; Wed. 3/12 Worship, Funeral Visitation with devotion and sermon at TR; Thursday 3/13 Visits in TR, Funeral at Naz, Worship and Bible Study at St. Petri. That adds up to 8 different sermons in the two weeks from 3/9 to Easter 3/23. But I like preparing sermons. Yes, I'm trying to catch up to reality. I had a few more members ask about why I wasn't posting as often. "Lent" I said. So here are some highlights from the end of the week after Louisa's birthday on Wed. Stella couldn't stay awake and fell asleep on a chair. I can't think how this was comfortable in any way. So she must have been tired. She tries to avoid her naps, and it catches up with her later in the day. Her face is pressed against the back of the chair. She fell asleep in a "frozen" position so that her head didn't fall down. 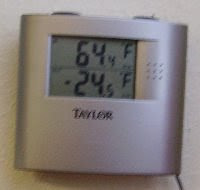 Thursday morning (3/6) was very cold. 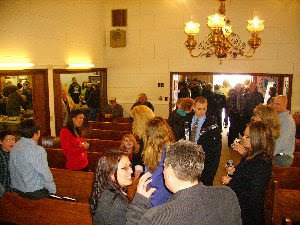 It warmed up to a balmy few degrees below zero F. by the time worship took place at St. Petri. 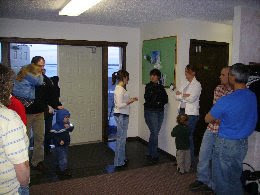 After worship was Bible study. It was really yucky driving on ice to get there. Snow had fallen on top of the ice. It was worse on the way home with blowing snow and a strong wind. The van started dying in the cold so we brought it down to Gary's in Fosston so he could figure it out. We think the problem might be temperature related. 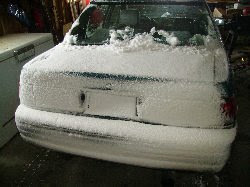 It seems to happen when it's 12 degrees below F. or lower before the engine compartment is warmed up. Friday (3/7) Louisa, Elsie, and the girls did dress-up. They chose to imitate Mr. Darcey and Jane from the BBC version of "Pride and Prejudice." If you want to know more about that movie just go to Mary's blog in the list on the left column. Let's just suffice to say that my kids and my wife quote it incessantly. "Why? Pray, should I wink at my daughter? I went to see Bert G. in the hospital Thursday (March 6). He was not very well. His lungs were starting to fail. As I write this (March 17) many readers know, and others should know that Bert passed away on Sunday morning, March 9. Bert and I had a great visit that thursday with devotions. I miss him. He was such a good story teller and had lived through so much good and evil in his lifetime. 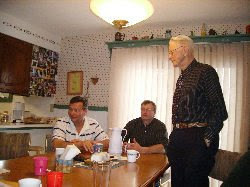 We had his funeral last Thursday (March 13). I'll try to post on that too. Creative cooking sometime during this past week. Shred some potatoes, throw in a bunch of Italian sausage, a few eggs, the left over mashed potatoes and left over ham, a fresh onion, and a bit of whey. The pancakes didn't last long. All gobbled up fast. Mary did a nice and considerate thing. She thawed the beef liver so we could have liver an onions for dessert. The liver was gobbled up too. Mary doesn't like it, and a couple of the kids don't like it. But the rest of us greatly appreciate their willingness to put up with the aroma at the table. 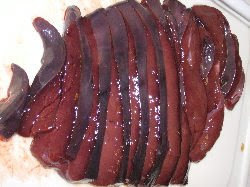 I really can't figure out why some people don't like liver. Again, as all the previous posts were, this one is backdated. It's Lent, and I can't keep up. I'll talk about my guilt about this some other time. Wed, Mar. 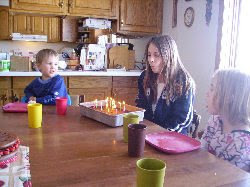 5 was Louisa's Birthday! We thank God that we have had the priviledge of having her with us these many years. And we pray that we can be together here in this world for many more happy years. But especially, as with all our children, family, friends, acquaintances, and the members of my congregation (who are also like family) we pray that we will all be kept faithful to the use of the Means of Grace, ensured by God's promise that we have eternal life because of the work of Christ ο Θεοανθρωπος [The God and Human] who died on the Cross for the sin of humanity. Louisa's party was on a Wednesday. That Wednesday was in Lent. 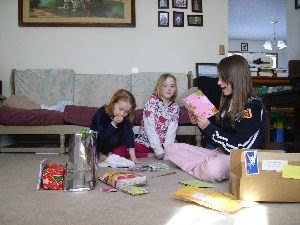 What that means is that Louisa had a quick, short, party over our noon dinner and afterward for gift opening. I was chomping at the bit to get over to my office to prepare a bit for Wednesday school, Lenten worship service, and Bible study. I'm sorry, Louisa, that your birthday party was so quick. But I hope you see how much all of us love you. Take this example. Probably you cannot read it. 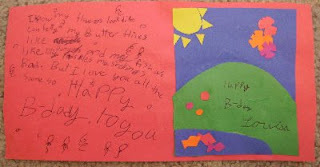 But this is a handmade card by Elsie for her sister, Louisa. I am amazed and humbled by how much time and effort our children put into making their cards. And I am constantly amazed by their skill and the beauty of what they create for each other. So, Louisa, Happy Birthday to you. Sorry I had to run off to Wed. School, Soup supper, Worship Service, and then, after a long day, come home just to be tired. I think I'll have to try to find some videos of "Josie and the Pussycats" for you. Your birthday gift makes you look somewhat like a character from that cartoon that I watched when I was a kid. 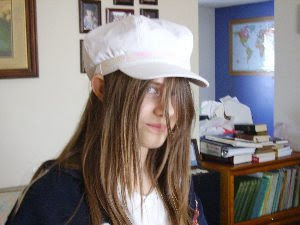 All I can say is that with that hat you remind me of someone in that TV show. Well, maybe it was Fat Albert. Monday the 3rd was a day off--for the most part. Tuesday I took Matt, Louisa, and Elsie to TR to get some stuff and for a surprise for Louisa. We left before noon, ate at Johnny's and put a big surprise on Louisa. 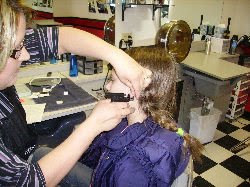 When we first went into the salon before going to Johnny's, Louisa thought it was to get Mat a haircut. You can see that he needs one. At first she didn't want me to take any pictures of the process, but she yielded to fatherly idiocy. Now she sprouts her first body modification. Two starter studs. She knows the drill, twist-em, put peroxide on em, till they heal up. This is a birthday present for her birthday tomorrow (3/7). Afterward we went to Wally World and got some stuff, including Matt's haircut--which turned out nice. Also, on this Tuesday the parish carpenters came to start putting in a wall downstairs for an additional bedroom. 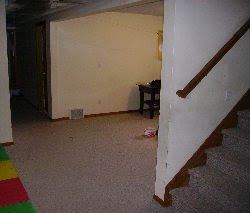 This is the "before" photograph. I had service this evening at St. Petri with Bible study afterwards. Some people go to extremes of buying special sprays to prevent those flash photo speed traps from getting their license plate. Up here we have a different way to solve the problem. But, it's not really a problem here. Since we don't have any photographic speed traps. Just waiting for technology to catch up with us hicks in the northwoods. Sunday was cold. 20 below F when I got up, but it warmed up to a toasty 17 below for my first service at Nazareth. Then off to Oak Park. Afterwards we all went to Grygla for the St. Petri Community Dinner. It was very difficult driving. 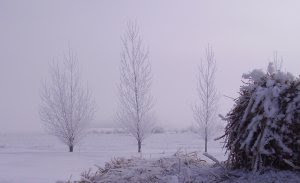 Snowing, Blowing, Zero visibility at times. It took almost an hour to go 35 miles, but we made it in the Van. I forgot I had my camera with until clean-up time. 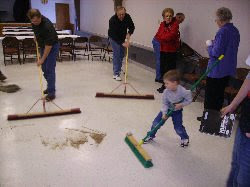 And there's my John right in the middle of the sweeping. 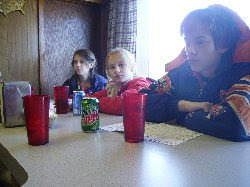 Afterward we went over to Dawn and Eldon's with a couple of other families and made a nice afternoon. Actually, I was trying to put off the drive home in this bad weather. I hope that I was good enough company. The conversation was great. But it came time to pack up our kiddlings and go home. 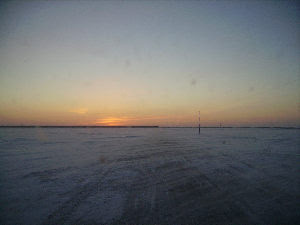 The sun was setting and we could tell where the road was by where the electric poles were. The sky had cleared, so there was no new snow. But as the folks up here say, "we may not get all the snow they do other places, but we use it a lot." Long trip home. Bed. Monday's supposed to be a day off. We'll see. 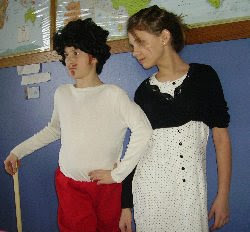 Steve and Sarah, the girls did themselves up for your boys. 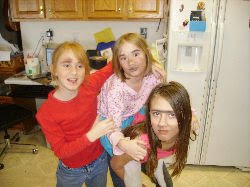 Louisa sprouts her "unibrow" and each of them has a 5 oclock shadow just to let the boys know what they are really like--chuckle chuckle. Here is an example of the truth. 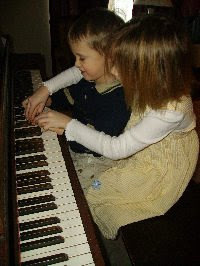 Clara, helping John learn to play "Peter Piper." Just let the boys know. Yeah, so much for following the calendar on these posts. Wednesday 2/27 was a pretty, if snowy morning. We had Wed. School, and a soup supper at Oak Park. 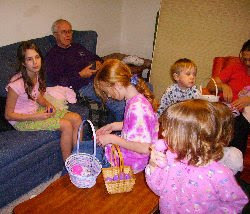 The congregations have been very nice to our youth groups this Lent. 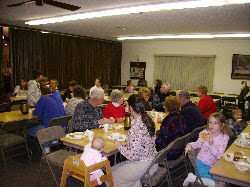 The congregations hold little suppers or snacks before or after service. I hold Bible Study after service. Mary Made a couple of really good soups for this one; Chicken-Rice-Tomato, and Clam Chowder. Both gluten free. Yum. I made sauerkraut and kimchi. I'm not ashamed to admit that my kimchi stank a great deal. Though many were brave enough to try it. 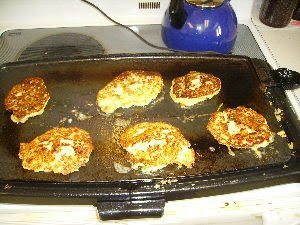 It did pack a bit of a spice kick--but nothing so serious my kids wouldn't eat. The difficulty with kimchi is overcoming the initial aroma when one is first exposed to it. Once you taste it, the aroma is one of the most attractive smells a person can experience. Well, for some of us, at least. Of course the kids have fun during this time. All kinds of good games are played during the supper before worship service. The news and stories during the meal are wonderful. I wish I could capture them all and put them down in a book. After a somewhat late evening we retired. 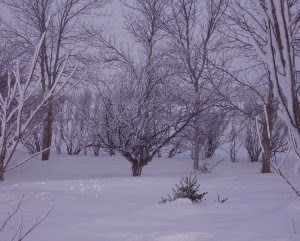 In the morning on Thursday I did visits in TR. There are a few places in TR that I can get food that is gluten free. During the day I eat either at Johnny's Cafe, run by Bruce and Denise Highness; or at China King--where the hostess (Shirley) makes sure that I have gluten-free Chinese. Johnny's is less expensive. So I stop there more often. I got to several shut-ins. But, drat, some of them weren't home. Can't blame them. But it is a bit frustrating. I know, some of you will say "Call ahead of time." But the truth is that calling ahead of time doesn't make that much difference. The same proportion of shut-ins will be gone. OK, this is long overdue. Lent is extremely busy around here. So I'm going back to March 1. 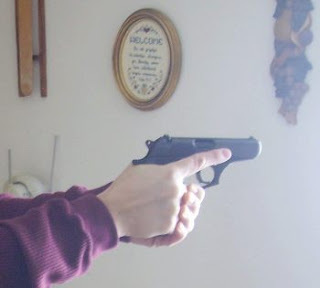 I took a photo of Mary holding her Bersa Thunder .380. I gave it to her for Christmas. This is a gift of a genuinely trusting husband--or so many men have told me. But I liked the irony that that she was holding the pistol and that the camera caught the "Welcome" memento framed on the wall. Perhaps my idea of humor is a bit twisted. But it tickled me. Saturday morning, Mary, Donna and I saddled up to go to Mt. Olive. There was frost out this morning. 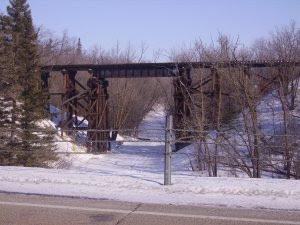 Maybe I already put up this picture of the trestle bridge in Gonvick. I forget. But I like the photo. After church I held Saturday School. 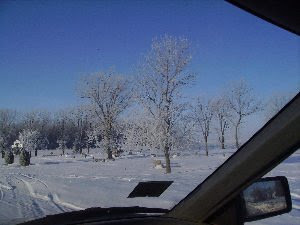 Then Mary and I went down to Fosston to pick up the van. The frost this week has been very beautiful. And this evening we had worship and Saturday School at St. Petri because tomorrow (Sunday, March 2nd, is their annual Community Dinner at the Grygla Community Center. Weather predictions didn't look good.